James Broderick Design Blog: Weapons!! Third year! Not long now until I get forcefully booted into proper adulthood, the course so far has flew by but at the moment I am simultaneously scared and excited for what this year brings. We have got some more staff this year and since we are based in the upstairs studio now we get a bit more time with tutors aswell to make sure we are progressing as much as we should, which is extremely welcome. Our first project of the year is up to us, kinda. We have a list of briefs ranging from realistic to stylised covering different subject areas, we pick three and spend 3 weeks on each project giving us plenty of things to work on. I was originally looking at the realistic briefs but the problem with them was that there wasn't too much creative freedom to change up the scenery. One of the briefs was to create a New York rooftop as an fps map using provided reference which to me personally is a bit boring since it's a type of environment which is done to death on games and portfolios and there isn't many ways you can shake up a New York rooftop apart from adding the same old air vent units. So what did I pick? 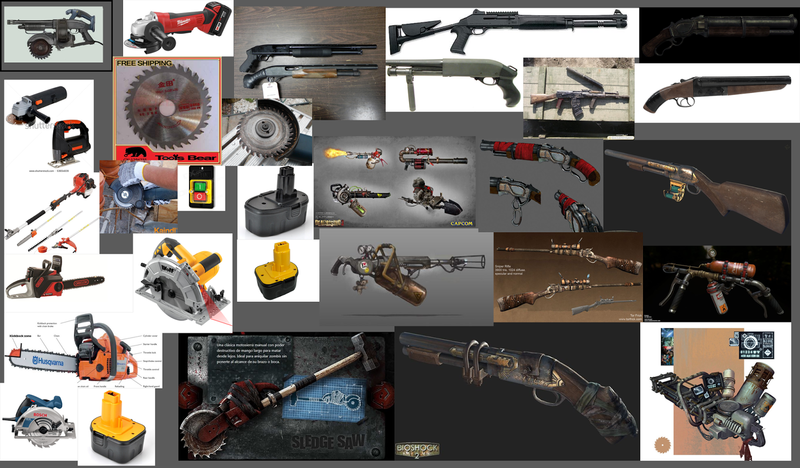 My first project is a semi-stylised apocalyptic weapons project which I will go into more detail with below. The second is stylised shop front that will have prebaked lighting which should be quite different from my usual stuff and the third is project where we are given a sci-fi-esque doorway and we have to create what could be beyond it in high poly and with procederal texturing. The last one I want to play around with a bit and not just make it a generic sci-fi corridor so I'm going to try and create some zany concepts to compensate. So for my first project I will be working on a semi-stylised weapon in the vein of dead-rising and bioshock. My current progress is creating the highpoly model from the concept but using good reference to fill in the design blanks. I started by choosing one of the base designs provided in the brief then finding related reference images, I tried to look at some different kinds of tools and machinery in a hope to bulk out the design holes. 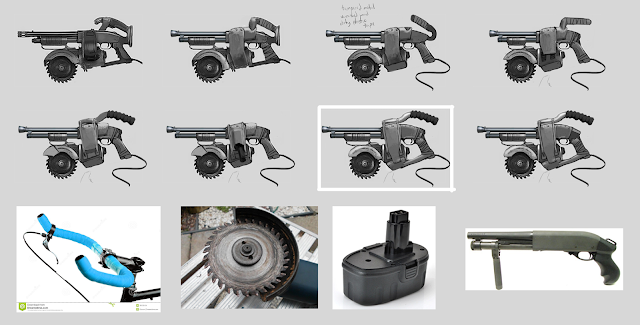 One consideration was how do I power the saw on the gun so I thought of ways I could use improvised technology within the concept, my idea was to have the gun wired up to a drill battery or something similar which could be strapped onto the player. 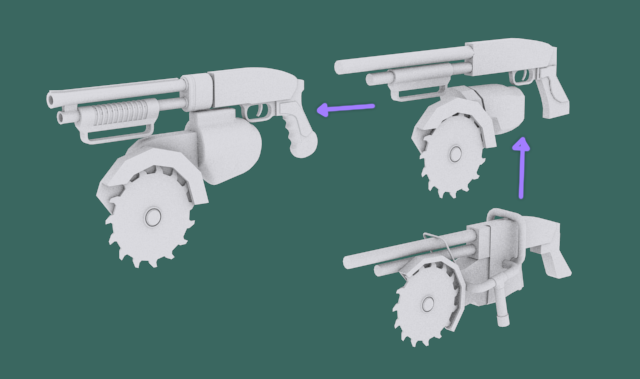 I also tried to keep stylistic references from the games mentioned in the brief so the gun stays in that visual style. Reference board used to fill in design blanks and stylistic direction. Here is my current progress, showing some previous iterations of the model which used different methods of holding. They didn't keep the silhouette as much as they should have thus I have my current design. The most recent model here in the chain uses high poly modelling to create extra details.